If I had to choose one word to describe how Incipio’s past iPhone offGRID battery cases felt, it would probably be “svelte,” as they were all impressively thin and gently curved. Starting today, Incipio is shipping its first offGRID case for the iPhone 6, and it notably trades “svelte” for “edgy” design. Offered only in matte black, it’s called offGRID Express ($80), and Incipio claims it’s the first Apple-certified iPhone 6 battery case that’s actually available for consumers to purchase. This time, the back is somewhat angular, due in part to a larger battery pack than prior models, and the sides are equipped with the fancy metallic button protectors rival Mophie has only offered in its most expensive Juice Packs. Incipio’s message is clear: by offering 3000mAh of power at an $80 price point, offGRID Express is practically daring Mophie – and any other Apple MFi-licensed manufacturer – to step up and take a swing at its value proposition. Yes, comparatively unknown vendors are selling cheaper options, and Tylt offers a 3200mAh, Apple-licensed alternative called Energi for $100, but offGRID Express actually matches it in recharging performance for a lower price. It’s positioned directly at consumers who care about both quality and cost, not just one or the other. 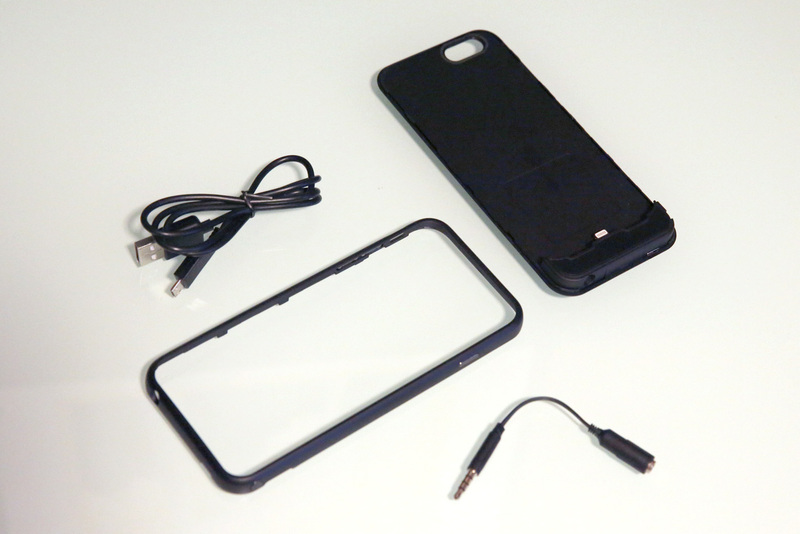 offGRID Express follows the same general pattern as Incipio’s prior $80 offGRID for iPhone 5/5s, arriving in a package with a micro-USB recharging cable, a headphone extension cable, a rear and bottom frame with a battery inside, and a wraparound bumper that covers all of the iPhone’s sides. Unlike prior offGRIDs, Incipio doesn’t include screen film or a cleaning cloth with this version, perhaps because the iPhone 6’s curved screen edges don’t look particularly good with film. No one else we’ve seen is including film with new iPhone battery cases, either, and offGRID Express partially compensates for the omission with better-looking and more tactile button covers than its predecessors. The bumper also provides around a half-millimeter of anti-drop protection for the screen. You attach the iPhone 6 to the Lightning connector, then place the bumper atop the rear frame, snugly sealing them together with little clips on offGRID Express’s edges. Incipio has upped the number of front power indicator LEDs from 4 to 5, changed their color to white, and moved the power button from the glossy front plate to a raised dot on the right side. If there will be any initial complaint about Express, it’s that the power button may accidentally get pressed in a pocket, but we didn’t find it flimsy enough to activate inadvertently. Similarly, the more angular back turns out to be a blessing in disguise, as it makes the iPhone 6’s back rest flat on a table, rather than rocking around. It’s worth noting that more expensive offGRID models will apparently be compatible with an optional dock; offGRID Express is solely recharged with a micro-USB port on its bottom, found on the opposite side from the narrowly-tailored headphone port hole. Although it’s not the highest-capacity battery case Incipio has ever offered — there were dual-battery kits with 4000mAh of power for $100 — the 3000mAh offGRID Express has the largest single battery of any offGRID I’ve tested. It promises to deliver exactly one full extra recharge for the iPhone 6, but outperformed that claim, enabling our test iPhone 6 to go from dead to 100% in two hours, then after a partial discharge, up an additional 21% in a quick 20 minutes. That’s 1% higher overall than Tylt’s Energi, which would be a meaningless difference except that offGRID Express has a $20 lower MSRP. That said, offGRID Express takes its time recharging using a micro-USB cable, though notably staying cool to the touch throughout. I’ve genuinely loved using Incipio’s past offGRID battery cases, particularly the offGRID Pro models, which for $100 have historically included dual batteries that together delivered far more than a single recharge for past iPhones. The $80 offGRID Express doesn’t offer that sort of power, and it’s not as slender as competing lower-capacity iPhone 6 batteries will likely be, but it narrowly beats Tylt’s Energi in performance at a markedly lower price. There will be a lot of new iPhone 6 battery case announcements in the near future, so it’s worth considering all of your options, but I’ve had great experiences with almost every offGRID I’ve tested for prior iPhones. Given its 121% recharging abilities, I wouldn’t hesitate to recommend this one.